Garden themes for preschool children can be a lot of fun. After all, what preschooler doesn't love to get his or her hands dirty, see plants grow, and watch the dynamic environment of a garden. Use these preschool garden themes for fun and learning. When it comes to garden themes, preschool possibilities are really endless. The important thing to remember when teaching preschoolers is that the process has to be hands-on, and it has to be interesting. Pollinators have a very important job in a garden. They spread pollen from one flower to another thus causing the flowers to grow. Make a Pollinator Book - Every page of the book should have a picture of a pollinator for the child to color. Preferably, the pollinators are indigenous to the area, and so in theory, they could see something from their book as they're walking around outside. Underneath every picture, there should be the following simple sentence: "The (Fill in the blank with a pollinator) helps spread pollen." In class, make sure and discuss that pollen is the way that new flowers grow. Read Eric Carle's A Very Hungry Caterpillar - Children love books like this, and what a great way to introduce the concept of a caterpillar becoming a butterfly. Study the life cycle of a butterfly - Butterflies give way to all sorts of creative art projects. If you can get a butterfly observation house, this is the ideal way to observe a butterfly from the caterpillar stage all the way to the end result. How Do Flowers Get Water? Have the children decorate their cups. Using a pitcher pour some water into each child's cup and then add a drop or two of food coloring. This experiment is best done on a Friday afternoon. By Monday, when the children come back, the flowers will be colored. This helps "show" the kids that the water was sucked up through the stem to color the petals. This is the ideal thematic unit if your preschoolers have a garden to work in. 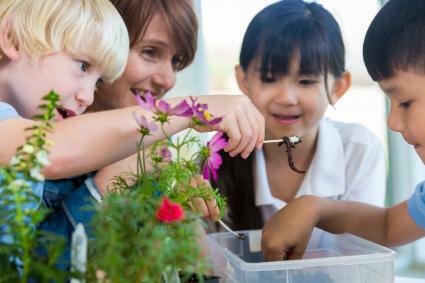 Many schools are starting a "green thumb" or school garden program, and so if your school has land but no garden perhaps a simple proposal to the principal will do the trick. This is also a great activity to share with the kindergarten teacher since gardening works in seasons. Preschoolers who plant in the spring can harvest in the fall of kindergarten. However, if you don't have a garden and can't get one, there are still a few ways to exercise your kids' green thumbs. Container gardening -Tomatoes will grow consistently well in a garden and are also fairly easy to grow with quick results making them the ideal vegetable for preschoolers! Window boxes - Window boxes filled kitchen herbs also grow well and do not require a lot of upkeep. Start the kitchen herbs from plants to ensure that your little ones don't lose interest. Garden tracker - Keep a chart on your wall that follows the life cycle of your garden from planting to harvesting. Make sure that when you harvest, your kids will be able to taste the fruit (or vegetables) of their labor! Gardening offers numerous benefits to the environment aside from just making it look prettier. Likewise, poor gardening practices can harm the environment. Compost - Talk about the benefits of composting and what composting does to help your garden. Composting is easy to do on your own as well. Locavores - Using a large map, try to trace the food that you eat to its original source. Have kids think about what they have eaten and then note how much could be eaten from local farms. Expert talks - If possible, have a local farmer or environmentalist visit the classroom. If that's not possible take a field trip to either a local farm, a farmer's market, a public garden, or a nature center. Garden themed activities can be super simple and require little to no preparation since they incorporate natural elements. Garden sorting - Enhance math lessons with a garden sorting activity. Give each child a variety of seeds, flowers, fruits, greens, or vegetables and ask that they sort them by one factor such as shape, size, or color. Seed sensory bin - Fill a sand or water table with seeds or dirt then hide plastic insects, tiny gardening tools, flowers, and harvested foods throughout. Kids can have free play time with the bin or you can challenge each child to find a specific item in the bin as part of a classroom relay race. Nature's finger paints - Put on the art smocks and pull out some white paper then give kids a variety of garden items that are rich in color like mud, flowers, and grass. Ask kids to create a painting using only their fingers and the garden items. Garden yoga - Look for kids' yoga poses named for things you might find in a garden such as Butterfly Pose, Flower Pose, Lotus Pose, and Tree Pose. Worm watching - You can either dig up some worms and dirt or purchase live Nightcrawlers from a bait and tackle shop to use for this observational science activity. Put the dirt and worms into a clear container that has a lid with air holes. Give kids the opportunity to observe the worms and share what they saw. Garden I Spy - You can play this game while in an actual garden or in the classroom while looking at a picture of a garden on the SmartBoard. Start by saying "I Spy something..." and give a clue about what the object you picked looks like. The first kid to guess correctly gets to spy something next. Flower coloring match - Start by having kids color pictures of spring flowers. Next, head out to a garden or garden store and challenge children to see if they can find a flower that matches any of the ones they colored. Make a rain cloud - Help children understand where the rain that waters the garden comes from with this easy water science experiment. All you need are a glass jar, shaving cream, and blue food coloring to demonstrate how rain clouds form. Would You Rather Eat This or That? - Help children practice tasting new foods while learning about a garden's harvest. Ask "Would you rather eat (name one fruit, vegetable, or dried edible seed option) or (name another option)?" Whichever option each child chooses, he or she then has to taste. Garden themes for preschool children can be an excellent way to get kids interested in the environment. 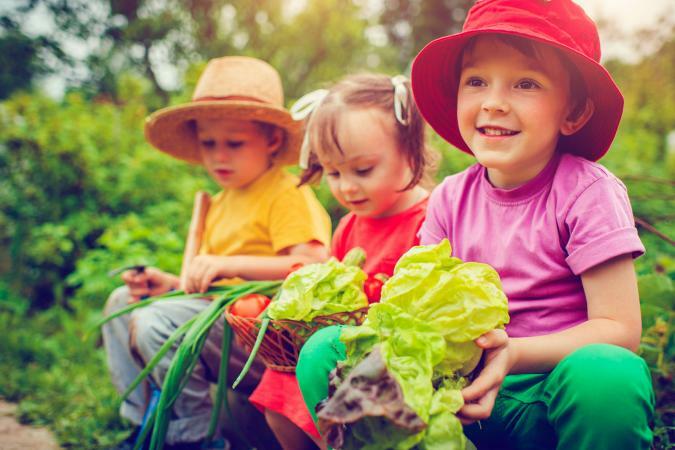 From indoor plants to outdoor gardens, kids can have fun learning about every aspect from planting to pollinating with a garden-themed activity.